I really wanted to go shooting this morning, at the very nice Uchee Shooting Range at the Tuskeegee National Forest near Auburn, Alabama. I have some new .223 loads I am just dying to try out. But no. King Barry has decreed that there will be no recreating, and has erected his Barrycades, along with His Royal Decree. The gate was closed and locked, too. THE KING HATH DECREED THAT NO RECREATING SHALL OCCUR! 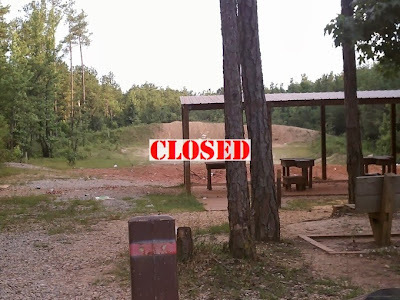 The roads in the Tuskeegee National Forest were open, as reported in the MSM, so I assumed the shooting range would be. I stopped by the Torch85 Truck Stop, as was my custom, to pay my $3 Federal User Fee and get a government-stamped piece of paper, that has never before been checked by a ranger in all the uncounted times I have been shooting there. The clerk at the store told me that the Forest Rangers told them not to sell any user fee slips, because the shooting range was closed because of the government shutdown. But he also said, with a wink, the people who check the slips aren't going to be there today. I decided to go in anyway, and got the picture you see above. I saw people riding horses and jogging in the King's Forest Tuskeegee National Forest, right next to the shooting range. Apparently, those forms of recreation are acceptable, but shooting eeeeevil assault rifle-shotgun-pistols is not. And again, I have never seen a ranger at the shooting range in all the times I have gone, so it's apparent that we can manage ourselves at the range. Your government at work, restricting the commons. I and millions of other Americas are getting really, really sick of this crap, and we are not blaming the Republicans. 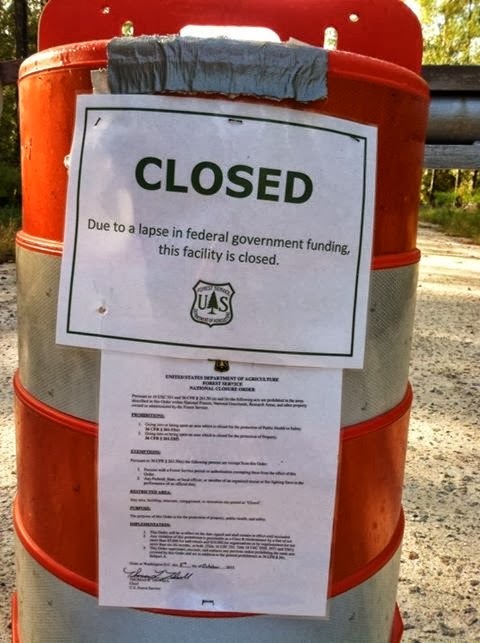 In 1995, Bill Clinton's executive branch experienced a shutdown, and I wasn't barricaded from going shooting or hunting in National Forests then. No, this is ALL Obama. And his minions. And most likely, Valerie Jarret. The question is, do I crash the Barrycades and go shooting anyway? Would an arrest and conviction for crashing Barrycades in a National Forest really hold up? Given the experiences of David Olofson, and what the ATF did to him, I have to admit to having 2nd thoughts. I'm not a 90-year-old WWII vet with nothing to lose. I'm thinking that if you are firing live rounds there won't be just one JBT show up to remind you the joint is closed. Indeed, Phil, if I decided to go in and throw rounds downrange, I'd need some fellow shooters there to have my back, because the JBT's would probably be thick. Then again, it's Macon County, Alabama, and the government slugs are pretty lazy around here. I just don't know if the battle is worth it. I recently had the same exact thing happen to me it's not like the shooting range was funded by the government. You had to pay to use it and I have rarely ever seen a day where it wasn't packed. It is very upsetting to know that our Government has so little respect for the common folk.